When building a heavy duty prop, start with something you already have and build onto/around/under/through/over it. 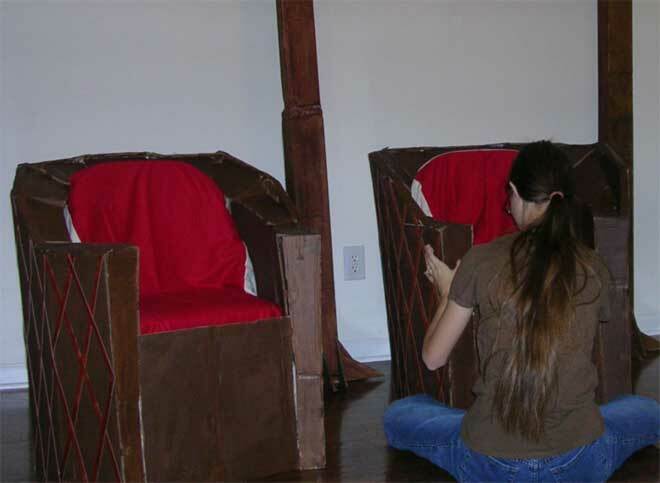 For example, we needed a throne with a very distinct look, and I didn’t want to use only cardboard because of safety problems. 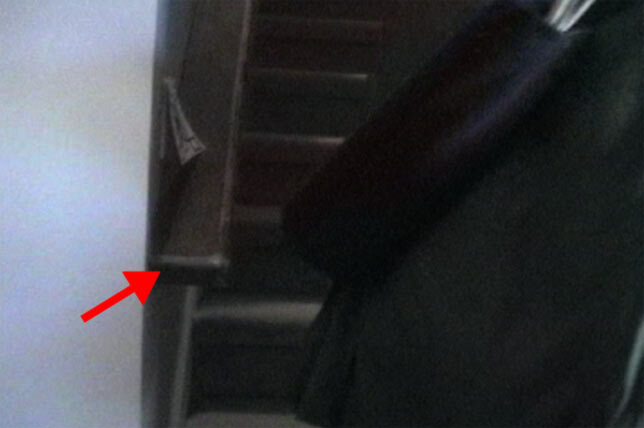 Trust me, you don’t want the actor falling through the prop in the middle of the first take! Our solution? 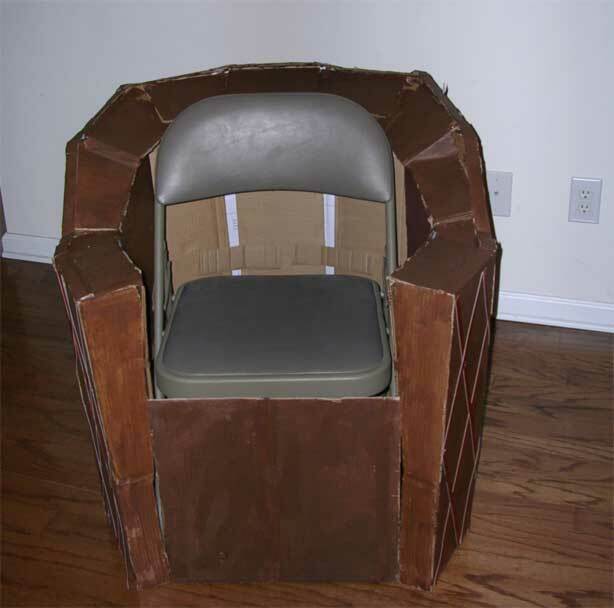 A folding chair. I simply surrounded it with cardboard to change its shape, and voila! A safe, nice-looking Cone Throne. Get rid of pesky outlets and light switches by covering them. This was a major problem for us, since we were filming a medieval movie. So we created squares of posterboard or paper with a little design on them and stuck the squares onto whatever we couldn’t hide behind props. You could use blank paper the color of the walls, sci-fi-looking wall units, fake plants, or whatever you want. 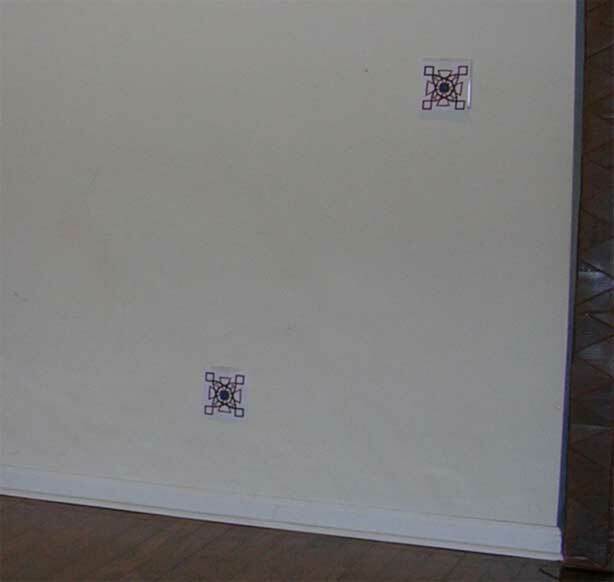 Just be careful about sticking tape on wall paint, and watch out for falling camouflage. Every so often they’d let go and sail off in the middle of a shot. 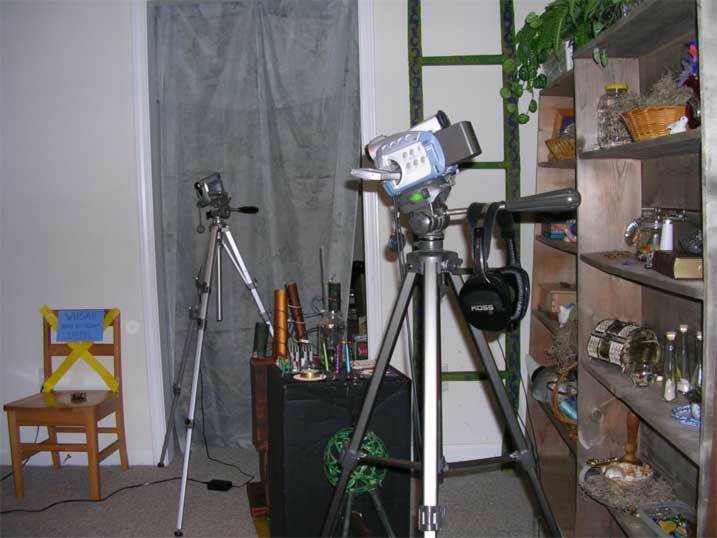 Also, while this works well for wider shots, it might be obvious in a close-up. 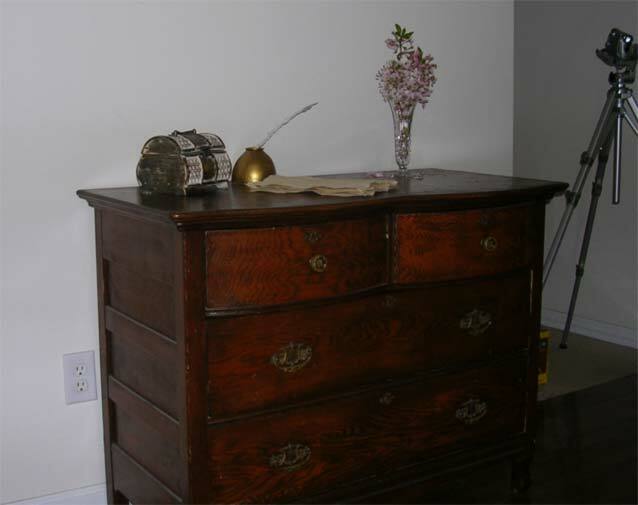 Work around irremovable parts of the room by disguising them. This is a biggie. 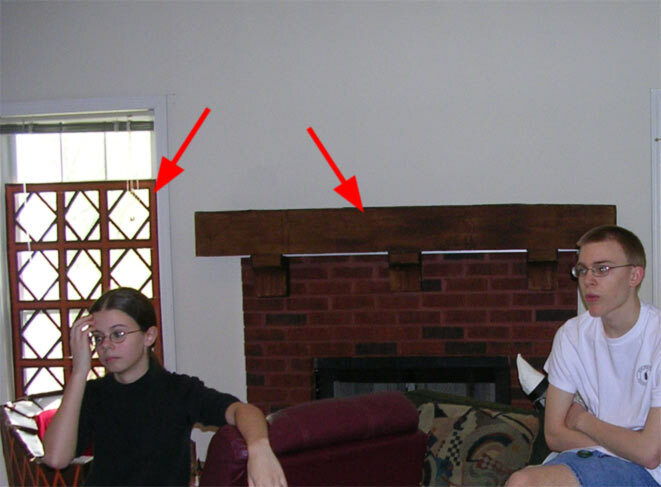 We couldn’t remove a modern-looking bannister from a stairway we were filming on, nor could we tear the fireplace out of the living room. Solution? Cardboard, of course! A little cutting, painting, hot glueing, and, hey presto! A medieval-looking fireplace and bannister. Another way to duck those annoying elements is to try not to show them, although this is sometimes impossible. Windows! Windows can be awful. The wonderful, modern-looking, white bars criss-crossing the glass. Cardboard to the rescue once more. You see how you can work around these things? Of course, the blinds are a whole ‘nother story. If your window has an air-conditioning unit in it, check the safety precautions before you try to cover it. We had all the things for this set laying around the house. We just made it look nice and neat. Just keep in mind what time period you’re working with. Don’t put an alarm clock beside a medieval bed (unless it’s part of a joke). If you want to do this on a much grander scale, check this set out. Only the two white walls existed there. 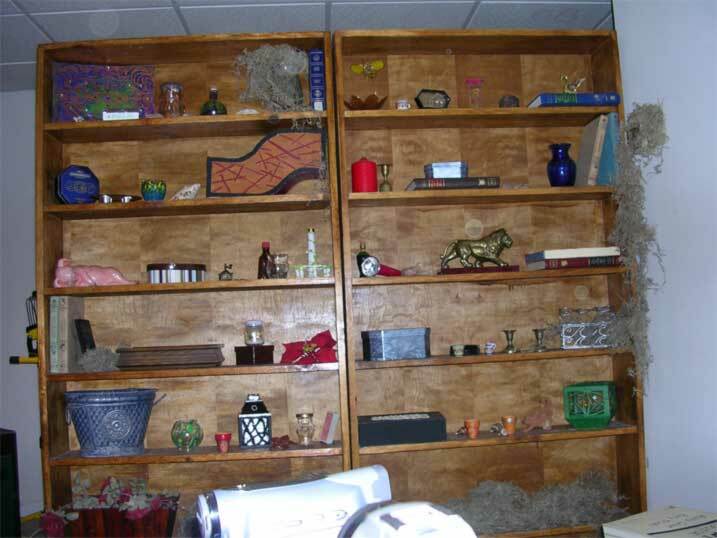 We created two more walls out of bookcases, then filled them with things from around the house, along with a few props I made specifically for it. Now, granted, I did throw in a few joke items. But you see how you can create whole rooms with things from around the house? It might not be time-saving (it took us all morning to get that set ready), but it’s inexpensive and the results are great. This entry was posted in Blog, Props and Costumes, Tips and Tricks and tagged camouflage, cardboard, designing, filmmaking, fireplace, props. Bookmark the permalink.